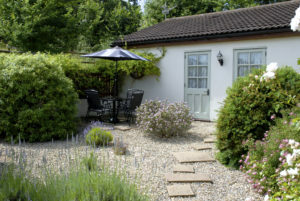 Ashton Cottages are two delightful holiday cottages that have been renovated with a country feel. Our guest will discover the open-plan lounge/kitchen/diner, a welcome space with a cosy homely feel. There is a TV with a DVD player built in and the cottages have WIFI. The kitchen area is a pleasant, light space and is well equipped with an oven, hob, microwave, fridge and washing machine. The kitchen cupboards house an array of crockery, glass wear and utensils. Leading of this open-plan area you will find two bedrooms, one double, one twin and a bathroom. The bathroom has a shower over a bath, WC and basin. Outside, both cottages benefit from private gardens set in a Mediterranean style with mature shrubs, patio area with table and chairs and a BBQ. This is a great area to sit, relax and soak up the peaceful setting around you. In addition to this space we also have a field attached to the cottages, which guests are welcome to explore, climb the hill, play games or just sit and take in the fantastic views. There are two off road parking spaces for each cottage, just outside the gardens. Cottage two – sleeps 4-5 people (1 double bedroom, 1 twin room and space for an additional z-bed in the double bedroom, for that fifth small person). > Z-bed available for cottage 2 only. Bed linen, towels and tea-towels are provided. Cleanliness is assured. Both holiday cottages can be booked individually or as a pair for extended parties. 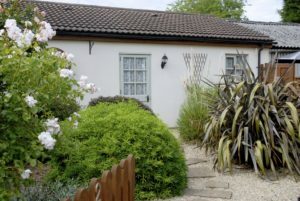 The cottages are single storey – ideal for young families.